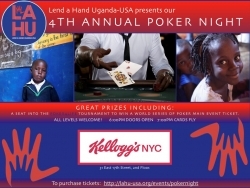 New York, NY, September 19, 2018 --(PR.com)-- On Thursday, October 11th, Lend a Hand Uganda-USA (LAHU-USA) will be hosting its Fourth Annual Poker Tournament at Kelloggs NYC to support its newest project: providing healthy lunches and a needed kitchen & cafeteria for LAHU-USA “adopted” school in the Wasiko district of Uganda, the Heritage Junior School in Ggangu. LAHU - USA is a registered 501(c) (3) non-profit organization, based in New York City. LAHU-USA is committed to facilitating empowering, sustainable change in both urban and rural Uganda. They strive to give community members the tools, training, and support to maintain and grow each project, and believe that this holistic approach fosters permanent change that will improve lives. They do so by adopting 1 school and community at a time through education and more.